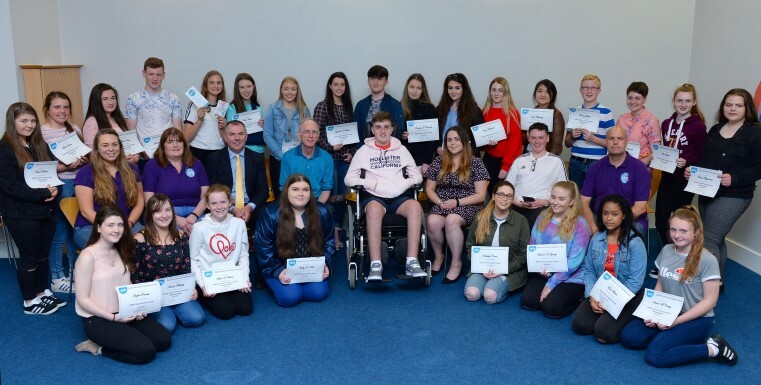 As part of the KDYS Building Futures campaign 112 inspirational young people from all across Kerry developed over 60 social action projects that have made a huge difference to their local communities across the Diocese in the last year. A wide range of projects and events were created and developed by young leaders as part of the KDYS Youth Participation Training. The Young Leaders were acknowledged and celebrated at a special night in Killarney with Bishop Browne, where they were presented with certs and their fantastic contributions were showcased. The Youth Participation Training equips young people with a set of critical skills which will last them a lifetime, skills including; leadership, negotiation, budgeting, project management and teamwork, communication and presentation skills. In addition the training provided a platform for young people to make a positive contribution to their local community by organising events and projects. From north to south Kerry young people involved this year contributed over 4,500 hours of their time to make their community a better place for everyone! Mr Tim O Donoghue, CEO said “Giving young people a voice and the opportunity to make a positive contribution is what youth participation is all about. Despite all the challenges facing young people today KDYS is committed to Building Futures for all young people and the communities where they live. This is a great example of what results from providing young people with the spaces, skills and opportunities to create change. Through our partnership with the Ring of Kerry Charity Cycle we are hoping to extend opportunities and programmes such as this to even more young people. We are asking everybody to get behind #teamKDYDS this year so that we can make this a reality”. People can help by signing up to cycle, sponsor a KDYS cyclist by visiting: http://kdys.ie/ or volunteer with the KDYS to help out in the Ring of Kerry event. KDYS has an exciting vision for young people in the Diocese. A future where all young people can realise their potential, a future where young people can learn the skills needed for their lives today, and to ensure a healthy and successful future. The range of supports provided by KDYS to young people focus on helping young people with; active and healthy living, personal development, arts and creativity, eating well and nutrition, helping transition from primary to secondary school, mentoring, preparing for the workplace of tomorrow, team building and leadership, mental and spiritual wellbeing, being resilient and dealing with anxiety, digital and online safety, learning skills for future employment.